When you decide to replace a kitchen faucet or even install a new one as part of a remodel, you’ll be surprised at the number of considerations you have to factor in when choosing which one you would like. I have come across many complaints over the years from people who have installed a faucet only to find it doesn’t quite tick all the boxes in terms of requirements (or the surroundings), or it just plain won’t fit. I choose this subject first because to be honest, it’s the first thing you should think about. And I don’t mean just ease of installation, because different models of faucet require a different number of holes in your sink unit. If you find you haven’t got the right number of holes, it is possible to add more (if your sink will accommodate them) but bear in mind this might make installation a little more complicated. Manufacturers are pretty good at telling you in their specs how many you will need when installing your new faucet. Just don’t be dazzled by that perfect chrome look and blindly purchase without checking this first (especially if you already have 3 or 4 holes in your countertop). 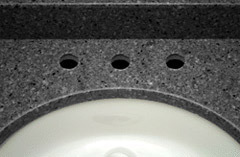 Faucets that require a one hole installation are usually those that come with the spout and handle integrated. You may even be able to get a faucet that has an integrated spray-head as well. The next most common is a three hole installation and the models that need this normally have either two levers plus the spout, an integrated handle with spout and separate side spray. This is yet another important point because not all sink areas are created equal. If you don’t have much head room then you need to think about how high the spout is going to be. I have reviewed some on my website that can be over 20 inches in height so make sure you check this out. 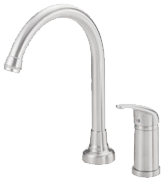 If you have a particularly deep sink, you might want think about a shorter spout height simply because this will reduce the amount of splash-back you get, and if you’re looking for a faucet that has an integrated spray, the pull down models will probably suit you best. It works the same way with shallow sinks. Pull out faucets are probably going to be better for you because you have more manoeuvrability with the hose, and a higher spout will make it easier to fill larger pots and pans. 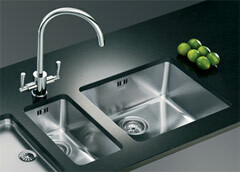 Pull out and side spray faucets are also great for those of you that have double sinks. Of course, I know this is something that everyone looks for first, and you may be a little disappointed to find you can’t have that high arc spout you’ve always wanted (or at least shouldn’t). There are of plenty options to choose from though, and for a little more guidance on that you can just check my section on different faucet styles. As you browse my website, I’m sure you will find something that will easily fit in with your current décor or even give your kitchen a lift.